Malaysian Blue Worms – the odourless living composter. Be a worm farmer at Home. You can farm it in your balcony, kitchen corner or garden. And what you get is pure grade organic fertiliser for your flowering plants, herbs, and vegetables. All you need to do is to feed the Malaysian Blue Worms with your kitchen leftovers. Fruit peels, vegetables, egg shells, newspapers, all make excellent food for these Super compost worms. Nothing goes to waste. The worm is the master recycler. It can eat its own weight of waste Everyday. 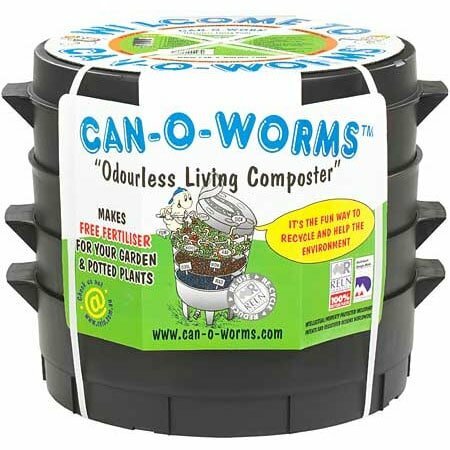 Available at Petmart, the Can-O-Worms is an Australian made composting system designed for people of all ages. Very, very user friendly. Odourless living Composter. Simple to set up. Can be used for a very long time. A real practical educational experience for the entire family and help save the earth. The number 1 choice of bait for Fishing. A premium food for birds and aquarium fishes. They are the best organic fertilisers money can buy. This entry was posted in Uncategorized and tagged live feeders.